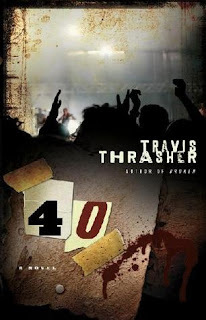 Firstly if you are going to read any of Travis Thrasher’s books, prepare a time to read and absorb uninterrupted! If you aren’t careful you will be left behind on his whirlwind tours! Tyler is 39 when an angel named Matthew appears to him and informs him that he is going to die on his 40th birthday. Tyler, turns introspective as he looks over his career as a record producer, his relationship with his parents, his achievements in life this far. Though he tries to run from Matthew, he seems to appear everywhere trying to help Tyler ‘get it’, that indeed his life is going to end and where should he go from here? Never giving much thought to Heaven or Hell for that matter, Tyler must consider all this as he flitters in-between reality and the unknown. I did have a harder time with this novel than I have with some of Travis’s other books. Not on my favorite of his list unfortunately. I thought for sure I would love it being I am 39 and nearing 40. It felt incoherent to me at times, like I got lost on the roller coaster ride and couldn’t find right side up. I do so enjoy his work so I was bummed to find that I didn’t care for this. The nice thing about Travis though is that his books don’t fit a specific mold. This just happens to be one that I didn’t like as much. I received a copy of this book from Faith Words in exchange for an honest review. I have not read any of Travis Thrasher's previous works, but I have seen a few at the Christian book store I go to. I think I will give him a second look. Thanks for the honest review.